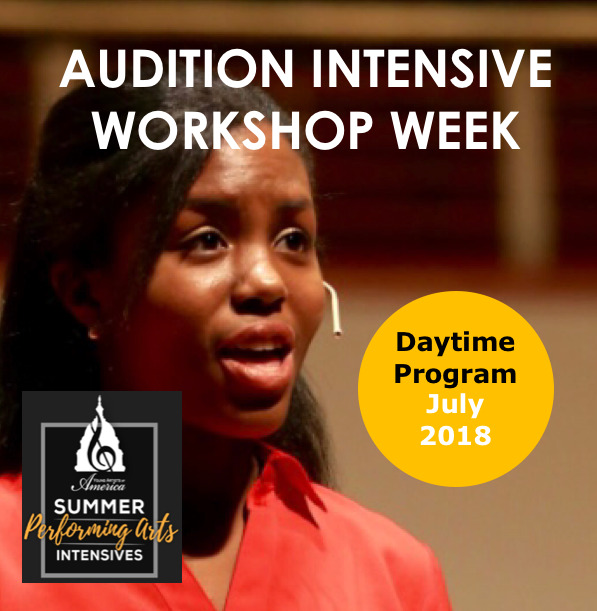 The Audition Intensive Workshop Week is YAA's newest Summer offering in 2018! Whether you’re auditioning for your school production, a college program, or a professional company, this Audition Intensive will help you put your best foot forward! It's open for 6th to 12th graders. We will address everything from how to research opportunities, to how to prepare your materials, how to find the right “package” for you, and how to prepare and polish your audition materials to better increase your chances for success! Monday, July 9 thru Friday, July 13, 2018 from 9:00am - 3:30pm. The 140-acre wooded campus at Sandy Spring Friends School, in Northern Montgomery County, Maryland, featuring a state-of-the-art Performing Arts Center, fully-equipped 300-seat proscenium theater, dance studio, and multiple rehearsal rooms. Optional School Bus service available from DC, Montgomery County, and Howard County! Colleen Daly, Voice Teacher - Read more about Colleen and the story behind this new program on our blog. Click here to read more about our Summer Intensives Faculty & Staff. A deposit of $200 is due upon registration (refundable until March 1, 2018). Final balance due on June 1, 2018 (non-refundable). Click here to pay your tuition. Limited need-based tuition assistance is available. Please inquire by email. Sandy Spring Friends School offers optional school bus transportation to and from campus during normal operational hours for an additional cost. They offer busing from a variety of locations in DC and Montgomery and Howard counties, such as: Rockville, Silver Spring, Bethesda, Gaithersburg, Kensington, Columbia and downtown DC. For bus pricing and more information please click here. Explore other Summer Intensive Options.